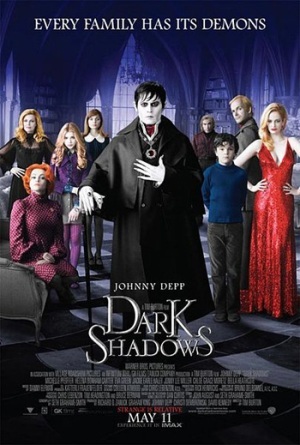 I braced myself for the worst after this film’s almost exclusively negative reviews, and although there were the odd moments that succeeded, overall Dark Shadows was largely a disappointment. Burton appears to have tried to pay homage to the original TV series by featuring a large collection of characters, which isn’t necessarily a bad idea, but in this case means multiple underdeveloped and slightly lacking stories. The cast is solid with people such as Johnny Depp, Helena Bonham Carter, Chloë Grace Moretz, Jonny Lee Miller, Michelle Pfeiffer and Eva Green featuring, but a number of these feel rather wasted, Jonny Lee Miller being the extreme example of this. The film’s plot about a 18th century vampire being locked away until the 70’s and then having to deal with his extreme culture shock does have a sense of fun to it which often works, and it does play around with its setting in entertaining ways such as including a guest appearance by Alice Cooper as his 1970’s self. However in this case pretty much all of the best jokes are contained in the trailer I’m afraid. Nobody gives a bad performance here, but then no one is great either, they all just feel a little tired and lacklustre. I say that, I will make an exception for Eva Green who here delivers a performance that’s far more interesting and developed than those given by her fellow cast members. I understand now why there was such a particular public rush towards saying that Depp and Burton should spend some time apart after Dark Shadows – the film does just feel a little weary, strangely even uninspired. It isn’t all out terrible, it’s enjoyable enough, but when you think back to some of the great work done by this team before, then it can’t help but pale in comparison. Unfortunately Dark Shadows is a case of missed opportunities; it has a lot going for it with a great cast, the amusing prospect of the vampire trapped in the 70’s, and what could have been a moving storyline, but as often as a joke goes down well or a sequence plays out nicely, there’s another one waiting around the corner where it will just fall flat. Good review. Definitely one of Burton’s laziest-attempts in recent memory and just goes to show you that him and Depp may need to take some time away from one another. Thanks, yeah it’s such a shame that their partnership is producing work like this nowadays. Especially as I rate Edward Scissorhands so highly in my personal favourites. What would you say is your favourite of their films? Edward Scissorhands is definitely their best collaboration. Burton has been a miss lately, however. And I certainly don’t intend to waste my time with that one. Glad to see love for Edward Scissorhands – such a great little film! Yeah it’s probably best to miss this one, in fact a strong case could be made for this being the worst Burton film unfortunately. Have you seen Frankenweenie? I haven’t yet but I’ve heard from a number of reviews that it is something of a return to form for Burton – which is something to be excited about. I saw Frankenweenie. I found it average. But now, I do recall liking Alice In Wonderland. I’ve only seen it once, and a rewatch could either cement that love or kill it. I’ve been putting Alice off for a while now – I want it to be half decent as I’m a fan of both the original books and the Disney film. It’s good to hear that you didn’t dislike Frankenweenie at least. Even if I don’t like it all that much it’s still good to see Burton potentially moving back toward that direction. You’re pretty much right that Burton and Depp should take some time apart, LOL, and I actually like a number of their collaborations! Yeah I too really like a couple of their collaborations, but it’s getting painful now watching them together. Yeah it started off pretty strong; it established the dark undertones and then brought in its humour, and for a short while I began to raise my hopes – but then it just fizzles out over time, losing all of its potential somewhere along the way. Glad you agree with me here Fogs! I agree with you, I thought Dark Shadows was a huge disappointment. Some jokes weren’t even funny. As for Depp and Burton – they lacked the effort. I’m not sure if that makes sense, but as you said it was lazy. Great review! Yeah a couple of those jokes really didn’t work. Cheers! Not the cast nor the Director seemed to be the problem on my viewing. The script however was lame. Really? I mean I’m not going to defend the script – it wasn’t good, but I felt that Depp’s energy and charisma fell short of the normal level, how much that is too do with him or Burton is difficult to say. Everyone else seemed to be giving rather vapid and halfhearted performances in my opinion, except Eva Green of course! Well they do have to emote and whatnot but they still have to work with the script they are given. This film seemed to not know what direction it wanted to go in. Horror comedy can be done well see: cabin in the woods but this film seemed unable to meld the two. Yeah the script is of course key, but I see Dark Shadows as a failure on multiple counts rather than just the script 🙂 . As it happens I still haven’t seen Cabin in the Woods – I plan on catching up really soon though! Thanks, if the amount of praise that it received is anything to go by, then I’m sure I will! I would definitely agree that Jonny Lee Miller is the most underused of the actors. Which story line(s) do you think should have been cut to give more balanced screen time so the film doesn’t seem so rushed? The Jonny Lee Miller storyline should have been cut; the little boy was looking for a father figure and so either JLM’s character should have either walked out near the beginning and then Depp’s character would take on the mantel, or JLM should have developed and become that figure. The film just left that as an unfinished storyline. For streamlining purposes I guess it would be easier to cut Jonny Lee Miller’s character. As much as I am a fan of Helena Bonham Carter, her role here was pretty unremarkable and unimportant. If that was cut there would be time to develop a relevant relationship between Barnabas Collins and the little boy. Chloë Grace Moretz’s werewolf issue could stay if it was actually made relevant, but not in its completely random and meaningless form. That would still leave a busy film, what with the whole Victoria storyline as well! Do you agree with any that I’ve said? If not, what would you cut? Yes I would agree with Miller’s character being the one to cut. The werewolf issue just seemed completely added in at the end for me also. I thought the ending between Victoria and Barnabas also seemed somewhat rushed, it was unclear whether she was the descendant of his original love or just haunted by her, so made the love story somewhat awkward in that he just replaced her with someone who looked like her. Unless of course it’s the same person!?! Yeah the ending was pretty rushed and unsatisfactory. Again, if they had more time they could have developed that further, and also have developed some chemistry between the two of them. Yeah, I went for this one to check it out, and I was incredibly disappointed. It really was one of the crappiest things that I had seen in a long time! Yeah it really was wasn’t it! It’s such a shame seeing as there’s some great talent involved as well.